The Auto Reset GFCI is 72" (6 feet) long and is designed to be used for our tankless gas water heaters and mini-tank electric water heaters that plug directly into 120VAC. The Auto Reset GFCI will automatically reset itself after a power loss to your home so you will not have to take any action when your power is restored. 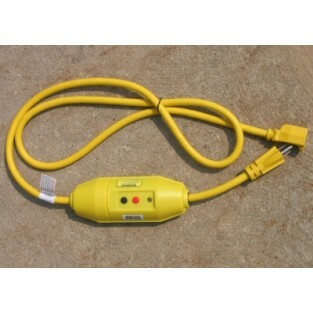 This GFCI has a 3 foot cord on either side of the GFCI and is designed for 15AMP 120VAC. Unit has a black water resistant case. Unit is UL and CSA approved. GFCI trip point is 4-6mA.